Chandelier floor lamps combine beauty with function. 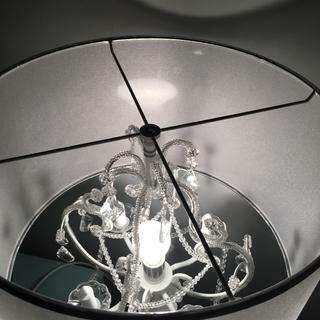 This design features an inner chandelier style light with crystal elements and a sheer drum shade. A charming accent for your living space, chandelier crystal floor lamps combine the best of two worlds. 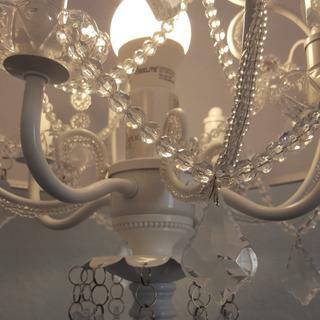 Up top is a chandelier style form with gorgeous faceted glass crystals. The crystals appear to be dripping from beneath the sheer organza shade. Display with shade, or remove it to create a stunning candelabra-like accessory. The turned column base is coated in an antique white finish, offering an elegant, old-world feel to the design. 64" high overall. Round base is 10 1/2" wide. Drum shade is 17 1/2" wide x 11" high. Chandelier-style crystal floor lamp from the Regency Hill brand. Glass beads and crystals. Antique white finish. Metal and glass construction. 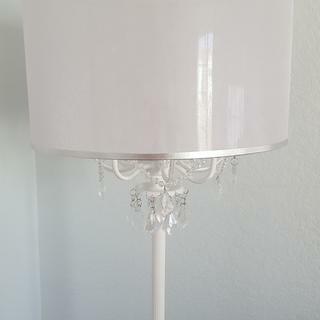 Sheer organza drum shade with silver trim. 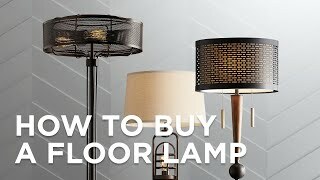 Lamp can be used with or without the shade. Saw it at my family's house and it's beautiful! Redecorating my master bedroom in whitewash with grey furniture. Only got one end table, so only one lamp. Wanted a floor lamp on the other side of the king bed. Good lighting as well as elegant and stylish. I liked the reviews too. 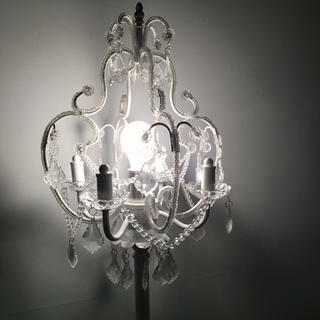 The Ciara Draped Antique Chandelier floor lamp looks elegant and the crystals are beautiful. I picked this design to put next to my white vanity. It will definitely add some elegance to the room. 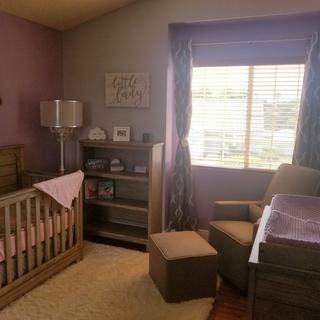 Baby's nursery :) has the look I'm going for . there are probably no missing parts . 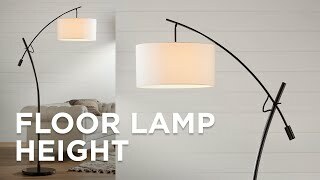 is the lamp about 64 inches tall from floor to top? mine had a lot of cord to and I found it strange but it went together well and it works and it is a wonderful accent piece. good luck with your lovely lamp. Is their a hanging crystal chandelier that has a slight resemblance to this floor lamp? BEST ANSWER: I have included a chandelier that will coordinate well with this floor lamp. Do you have any more see-through chandelier lamp shades? 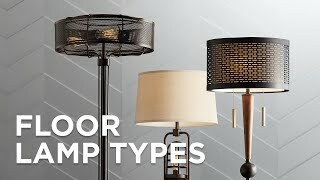 BEST ANSWER: This floor lamp would be the only collection that we offer with a see through shade. We wanted something to go with our crystal dining room light since we have an open concept home. This is too beautiful for words and gives off so much light to read. The price was reasonable and adds another touch of elegance to our home. Even nicer than in the picture. In place of a painting I chose this lamp to add light and a dramatic flair to a corner . Elevated my shabby chic decor. In all the years I have ordered anything that was delivered, this lamp was packaged the best. I was so impressed. Each piece was wrapped individually and there was not a flaw anywhere on this lamp. This lamp was so easy to assemble. 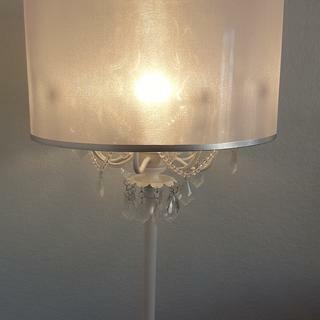 Very elegant lamp for a great price! It was a lot heavier than I thought it would be, it's very sturdy which is great. I like how it is versatile and you can use it with or without the lamp shade. It was a perfect addition to my daughter"s nursery. This lamp is gorgeous! And it was wrapped wonderfully for shipping and is a real sturdy piece! It's the perfect addition to our nursery. I need a light in my bedroom. I wanted something with some drama and elegants. This light is perfect. The picture doesn't do it justice. So beautiful! I love the organza shade, it’s all so elegant. 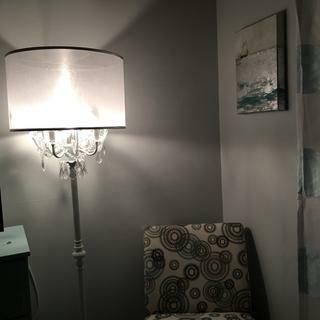 Love my Chandelier Floor Lamp and the Daily Sale price was exceptional!! 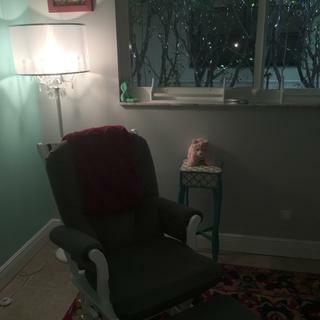 I also purchased a dimmer switch too for added evening ambiance and charm!! Very elegant, not tacky at all. The lamp is more beautiful in person. It’s heavy and sturdy. It’s not a bright white or a cream but somewhere in between. I would definitely recommend to a friend. Absolutely beautiful! It was everything I thought it would be and more. Offer traditional beauty to your decor in the form of this transitional swing arm metal floor lamp. A beautiful floor lamp design with elegant scrollscrackled finish and twin side lights. The crisp antique white finish of the turned-style base of this charming floor lamp is perfectly complemented with an off white linen shade. Energize a traditional room with the gorgeous aesthetic of this metal and crystal budding floor lamp.